This could be a very quick yet filling lunch or dinner on-the-go. 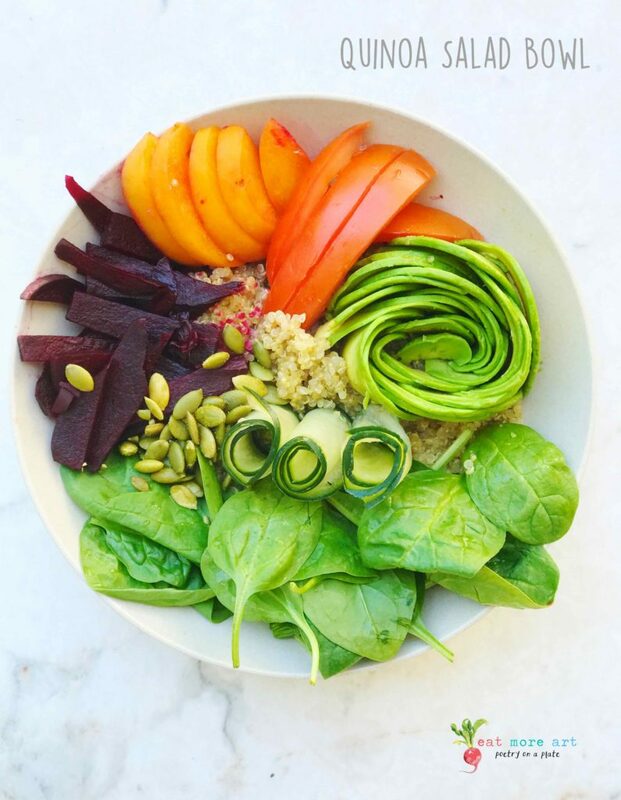 It looks great, it tastes amazing, and it is a wholesome plant based salad in a bowl that will nourish your mind, body, and soul. It is a very quick and easy recipe. 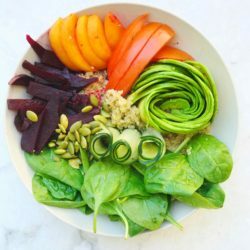 Wash quinoa well – 2 to 3 times – so that the bitterness goes away. Boil quinoa with a pinch of salt. Drain out excess water, if any. Fluff it up with a fork. You can boil it either in a simple utensil, or instant pot, or a pressure cooker. Blanch the beetroot. This takes away the bitter, earthy taste and makes it a softer texture. You can also use it raw if that’s the taste you prefer. Peel the beetroot and cut it in slices. For blanching, heat water adding salt, bring it to a boil. Add the beetroot and keep it for about 4-5 minutes. 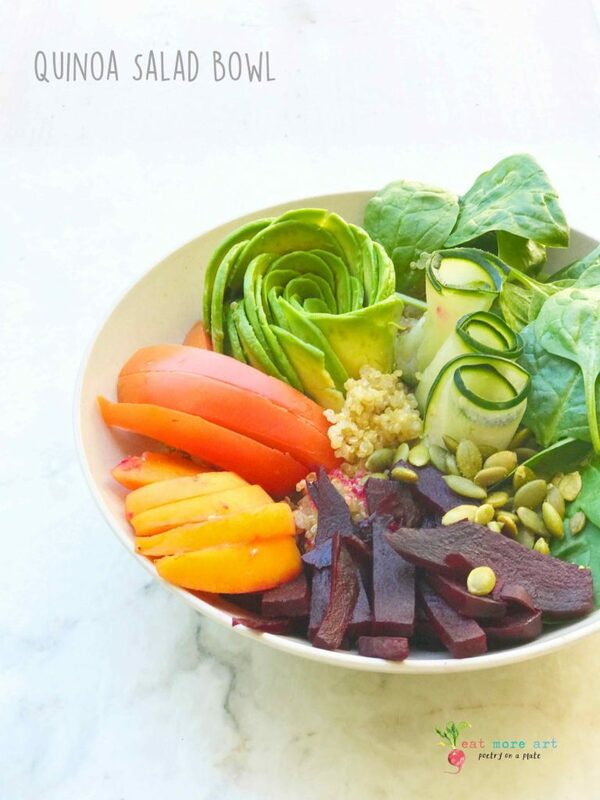 Turn off the heat and remove the beetroot. Slice the cucumber vertically using a vegetable slicer. Roll it up as shown in the picture. Peel, slice avocado. You can also make it into a rose as shown in the picture. Check out the recipe notes for the video link on how to make an avocado rose. Deseed the apricot and cut into slices. 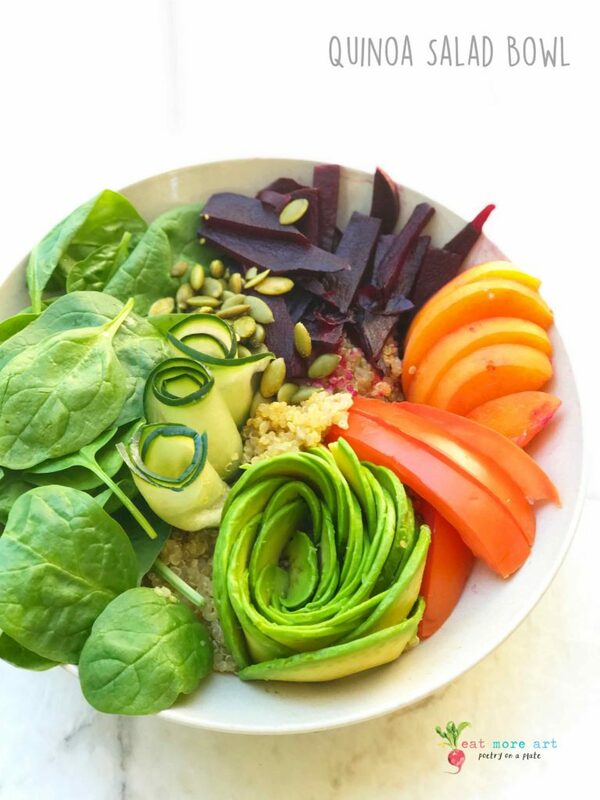 Layer 2 bowls with quinoa, top it with spinach, tomatoes, apricots, beets, cucumber, avocado. Sprinkle some roasted sunflower seeds, freshly ground black pepper, and salt on it. A wholesome bowl of goodness is ready. You may use any of your favorite dressing if you like.